This was commissioned, but I'll soon have just the embroidered overlay for Frank's dinner corset to purchase separately. 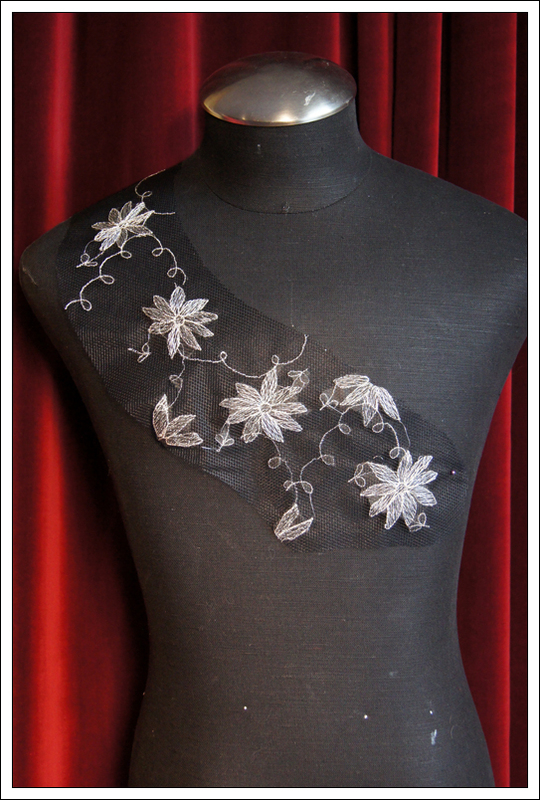 I used metallic silver thread on black tulle. Because tulle is so holey I used a black tear-away stabilizer that is still visible under the petals, but once it's laid over the black dinner blouse & corset it will be completely invisible. I recommend just whip-stitching it to the blouse by hand. how much will these be when their available? It's listed for $30 (it takes two separate hoopings) - but unfortunately I can't fulfill any orders before Halloween.